PORTLAND, Ore. – (September 5, 2018) – Shelley Uvanile-Hesch knew her truck was a beauty queen and now it has the title to prove it. 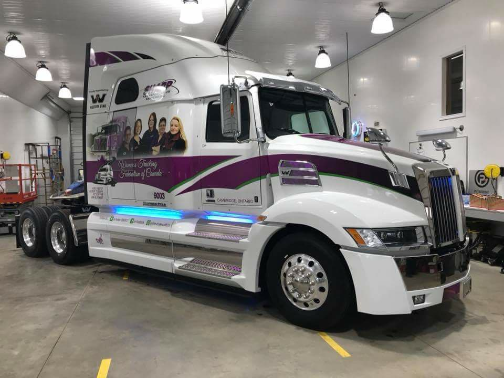 Uvanile-Hesch drives “Miss Destiny Star”, a 2019 Western Star 5700XE that has been decorated with a truck wrap featuring pictures of members of the Women’s Trucking Federation of Canada (WTFC). She founded the organization, which recruits women drivers, dispatchers, technicians and managers to the Canadian trucking industry. Miss Destiny Star’s purple-and-white graphics package recently won the Private Motor Truck Council of Canada (PMTC) annual 3M Vehicle Graphic Award in the Special Event/Promotional category. 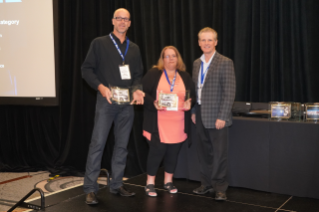 The award was announced at PMTC’s annual conference. The contest, which includes other categories, draws hundreds of entries a year. The wrap was donated to WTFC this year by Western Star, which is a corporate member of the organization. WTFC worked closely with local dealership Highway Western Star in Ayr, Ont., on the design of the wrap and the 5700XE’s other striking features, including a custom blue-and-pink LED lighting scheme. Miss Destiny Star, which Uvanile-Hesch drives for Sharp Transportation of Ontario, is a beautiful truck with a positive message, said Mike Millian, president of PMTC. Uvanile-Hesch said she is thrilled, but not surprised that the truck won the graphics award. She’s seen the reactions it gets at truck stops and terminals and from other drivers. When she is not driving the truck on her regular routes through the United States and Canada, she takes it to trucking shows and promotional and charitable events, where she talks to women about careers in trucking. WTFC, which has about 300 members, also mentors women in driving schools and hosts career events at high schools. For more information, go to WesternStarTrucks.com. Western Star Trucks Sales, Inc., headquartered in Portland, Ore., produces tough custom trucks for highway and vocational applications. Western Star is a subsidiary of Daimler Trucks North America LLC. Daimler Trucks North America produces and markets Class 5-8 vehicles and is a Daimler company, the world's leading commercial vehicle manufacturer.